Futuremed's new P8000 Power is a sleek, attractive and economically priced instrument that lets you start out with a resting ECG and add (gradually, if desired) the ability to perform spirometry or exercise stress testing. - A high resolution digital printer generates full page (8.5 x 11”) reports. feature lets you print non-fading reports using generic copy paper. Full alphanumeric keyboard for personalizing reports with patient data and physicians' notes. Shortcut buttons make navigation easy and fast. Real time display of flow/volume or time/volume graphs help ensure test quality. The high resolution screen also lets you preview tracings prior to printing. Multiple spirometry interpretation programs including Knudson, ITS, ERS and others. AC/DC operation with a rechargeable battery (~300 ECG or 100 spirometry reports/charge), ideal for mobile testing and in emergency situations. 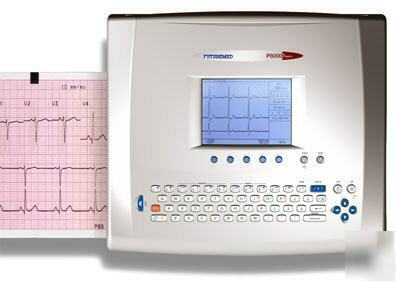 Pre-acquisition: Provides 10 seconds of instantaneous ECG acquisition and printing in 3, 6 & 12 channel formats. Predicteds: Crapo, Morris, Knudson, Knudson76, Polgar, others. Extrapolated predicted values. Size: 39 x 33 x 10 cm / 15" X 13" X 3.9"
Battery: Built in 12V lead acid battery. ~ 4 hours of use per charge. Size: 320 x 240 pixel, 3 1/2 x 5"